I invite you to join me on Wednesday, January 9th, 6-8pm at the ARC (1701 W. Ash St.) for the City of Columbia’s Neighborhood Congress. This important public engagement event will include discussion sessions on affordable housing, economic development, and neighborhood infrastructure/revitalization. Your input will be incorporated into the City of Columbia’s next 5-year Consolidated Plan, which will direct federal and local resources for affordable housing and community development in Columbia. Social equity - to strengthen our community so all individuals can thrive - is one of the priorities in the City’s 2016-2019 Strategic Plan. Authentic public engagement is critical for developing an effective plan that reflects the values of the community, and so I hope you can make it to the Neighborhood Congress to help shape Columbia’s future and guide how public resources are expended. Please register here. For more information, check out this flyer or contact Randy Cole. What do you think should be City's top priorities for our 2019-2022 Strategic Plan? Do you have a vision for the Columbia of the future? What policies and funding priorities do you want the City Council to adopt to advance that vision? And what are you most concerned about - is it growth, public safety, affordable housing, or the economy? All three meetings will be held at the Activity and Recreation Center, 1701 W. Ash St. Dinner will be served, childcare will be provided, transportation is available, and each participant will receive a $25 gift card. For more information and to register, please contact Carol Rhodes at Carol.Rhodes@como.gov or 573-874-7219. 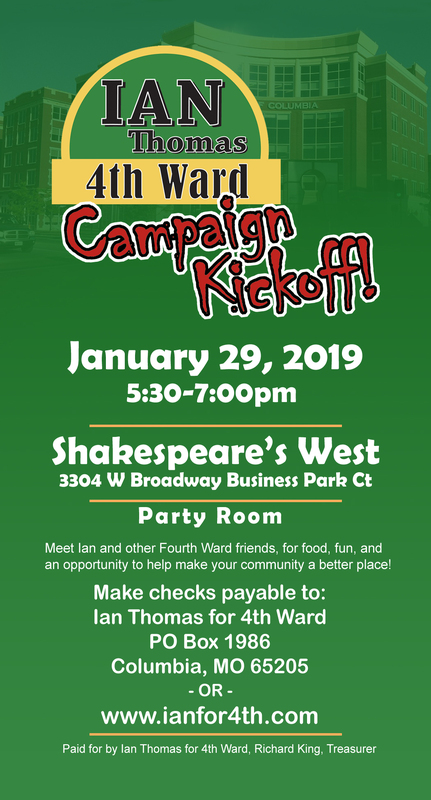 Please join me on Tuesday, January 29th at Shakespeare's West, for my 2019 City Council Re-election Campaign Kick-Off event. Your feedback on my 2019-2022 Policy Platform is important to me, so drop by the West location (3304 W. Broadway Business Park Ct.) between 5:30 - 7:00 pm to enjoy Columbia's best pizza and share your suggestions for improving our community. Finally, please let me know if you would be willing to host a yard sign, volunteer for my campaign, or assist with our "Get Out The Vote" effort in March. My next Constituent Conversations will be held on today (Sunday, January 6th), 2-4pm at Dunn Bros. Coffee, and again on Sunday, January 20th, same time, same place! Upcoming dates are always available at my web site.